Directions: From the east end of 62/412 (bypass) in Mountain Home, travel on 62/412 east (toward Lake Norfork) 4.2 miles. Turn left onto AR101N. Proceed another 4.2 miles and turn left onto BC806. (101 Mower Mart is on the right and Turn left at Maynard Bend Cemetery). Proceed 0.6 mile and turn right onto Briarwood Lane. Stay left at the little white pump house onto Briarview Lane. The smaller of the two houses is the studio. Plenty of parking. Inspired by diverse and legendary artists, Jeanne Roth lets her imagination run wild on her canvases. “Growing up as the oldest of six children in Cape Girardeau, Missouri, I was always interested in art,” says Roth. After she graduated from college, she married and moved to St. Louis County where she and husband Wayne raised two girls. “When our daughters were in high school, a one- day substitute position turned into a 20-year career as an art teacher,” Roth recalls. 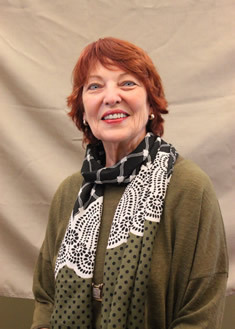 She and her husband retired to Arkansas in 2000, and Roth has been active in the local arts scene ever since. “My life is artful,” she laughs, “as I participate in clubs, shows, and exhibitions, teach workshops and create in my studio.” Roth’s current favorite mediums are watercolors, acrylics and collage. Within those bounds, and inspired by everything from Henri Matisse’s use of pattern to Vincent Van Gogh’s colors and brushstrokes, Roth begins with a vague idea and then lets her imagination soar. “I often paint flowers as subject matter,” she says, “although they may not resemble garden flowers. They may bloom only in my mind and on my canvases.” As a former art teacher, Roth says she always enjoys experimenting with new methods and materials when creating her art.